On Wednesday evening, the leaders of the Sheikh Zayed Institute's Bioengineering Initiative collaborated over a traditional Yemeni meal of chicken and goat, eaten by hand while seated on the floor. Over dinner, Dr. Sze and Dr. Safdar shared their observations of the health system of Abu Dhabi after visiting several hospitals and meeting with officials about opportunities to expand our relationship through education and training, clinical care, and partnerships. On Tuesday afternoon, we held the inaugural meeting of the Executive Oversight Committee of the Sheikh Zayed Institute for Pediatric Surgical Innovation. In Abu Dhabi, Children’s National participants (Dr. Kurt Newman, Jim Lintott, Pam King Sams, and Miriam Markowitz) were joined by His Excellency Zaid Al Siksek, CEO of the Health Authority-Abu Dhabi (HAAD), and Dr. Ali Al Ali, director of health regulation at HAAD. Participating by videoconference in Washington, D.C., were Edwin K. Zechman, Jr., president and CEO; Dr. Peter Holbrook, chief medical officer; and Ray Sczudlo, executive vice president and chief legal officer. After the committee was formally charged and committee memberships were approved, Dr. Newman presented a progress report on the Sheikh Zayed Institute as well as a financial report. Mr. Zechman and Mr. Lintott then reported on accomplishments, priorities, and plans for Children’s National. After communicating with officials at the Health Authority-Abu Dhabi by phone, email, and mail over the past year or so, it was our pleasure today to meet with them at their office for the first time. 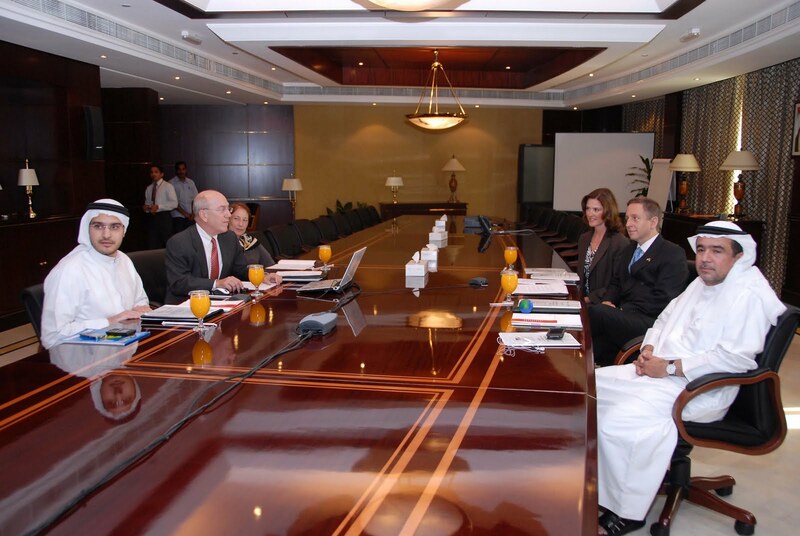 Our doctors gave several HAAD officials a progress report on the Sheikh Zayed Institute for Pediatric Surgical Innovation and discussed ways to possibly extend our partnership to benefit children in the United States and the United Arab Emirates. Tomorrow will be the first meeting of the Executive Oversight Committee, by videoconference linking Abu Dhabi and Washington, D.C.
Our various meetings today underscored HAAD's commitment to improving the health of children in Abu Dhabi and beyond, and we look forward to extending our partnership to provide tangible benefits to families in Abu Dhabi and the UAE. After our meetings this afternoon, Dr. Kurt Newman, Jim Lintott, Dr. Zena Quezado, Dr. Ray Sze, Jim Lintott, Tricia Paulino, and I visited the Sheikh Zayed Bin Sultan Al Nahyan Mosque, commonly known as the Grand Mosque. The mosque is the largest in the United Arab Emirates and one of the largest in the world, covering 22,212 square feet -- the size of five football fields. The design is primarily Moroccan but was also built with artisans and materials from Italy, Germany, India, Turkey, Iran, China, Greece, and the UAE. It was constructed with natural materials -- marble, stone, gold, semi-precious stones, crystals, and ceramics -- and includes the world's largest carpet and the world's largest chandelier. As part of our meetings at the hospitals yesterday and at the Health Authority-Abu Dhabi today, we welcomed several new partners to the Sheikh Zayed Institute for Pediatric Surgical Innovation. 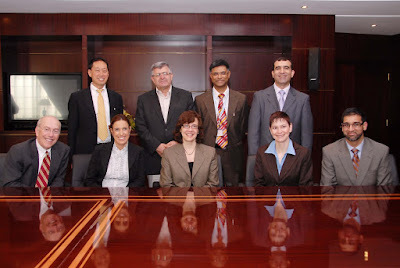 Pictured here are our doctors with Dr. Fares Chedid, senior consultant neonatologist at Tawam Hospital, Dr. Jaishen Rajah, chair of pediatrics and senior general pediatrician at Sheikh Khalifa Medical City, who have been appointed to the Research Advisory Committee, and Dr. Mohamed Hamdan, senior consultant and head of pediatric cardiology at Tawam Hospital, who has been appointed to the Scientific Advisory Committee. We are pleased to welcome Drs. Chedid, Rajah, and Hamdan and look forward to collaborating with them to advance the goals of the Sheikh Zayed Institute. In the afternoon, Dr. Raymond Sze and Dr. Zena Quezado visited Sheikh Khalifa Medical City (SKMC), a group of health care facilities located on an island that's five miles wide and nine miles long. Managed and directed by the Health Authority-Abu Dhabi, the medical center provides comprehensive care through its Centers of Excellence. Earlier this year, the hospital performed the first-ever pediatric kidney transplant in the UAE, with a 40-year-old donor and a 5-year-old recipient. 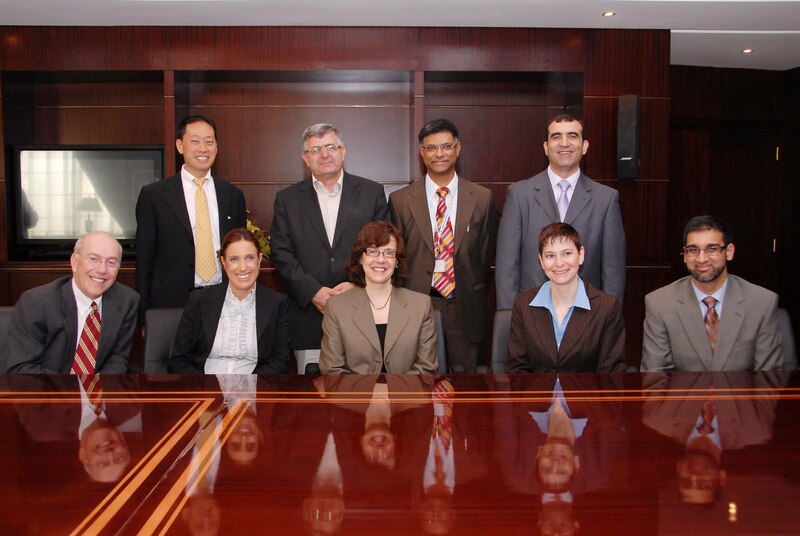 Joined by Miriam Markowitz, corporate vice president for strategic planning and business development, and Oussama Elbaba, director of international programs, Dr. Sze and Dr. Quezado presented updates on their respective areas of the Sheikh Zayed Institute, bioengineering and pain medicine. The presentations provoked a lively discussion, especially on the safety of anesthesia and trends and ethics related to pain medicine. When Oussama reported that Dr. Quezado received at least 10 questions, compared with Dr. Sze's three, Dr. Sze quickly countered: "But my three were quality questions." 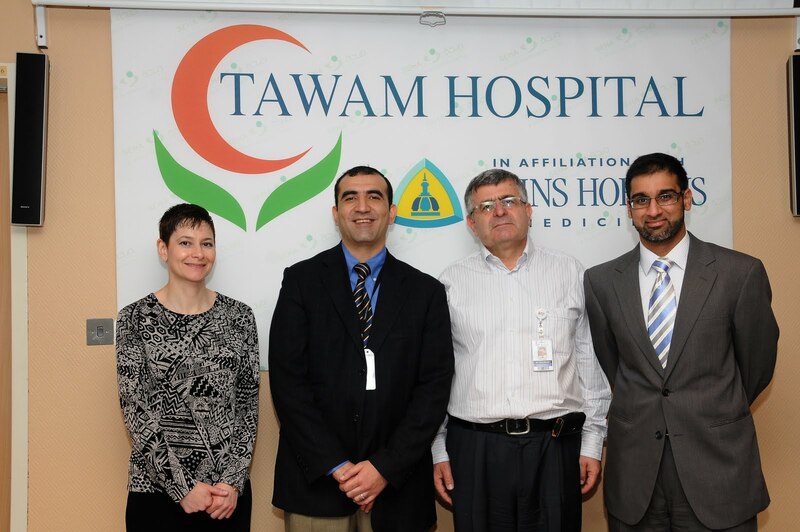 I was fortunate to be able to join Dr. Julie Finkel and Dr. Nabile Safdar for a visit to Tawam Hospital in Al Ain, an hour and a half drive from the capital, near the border of Oman. The hospital, which opened in 1979, is called "an oasis of care" -- fitting, because Al Ain's greenery and seven oases have earned the city the name "the Garden City." Al Ain is also the birthplace of Sheikh Zayed bin Sultan Al Nahyan, for whom the Sheikh Zayed Institute for Pediatric Surgical Innovation at Children's National Medical Center is named. We were pleased to be joined by a Children's National colleague we had not met before -- Issam Ramadan, who is the director of our Abu Dhabi office. It was helpful to have someone who speaks Arabic, but everyone at the hospital was warm and welcoming, and language was not a barrier. 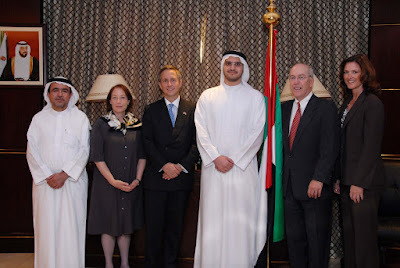 We discussed the work at the Sheikh Zayed Institute and priority health needs in Abu Dhabi with about a dozen of the hospital's top physicians. One of them, Dr. Mohamed A. Hamdan, the head of pediatric cardiology, has been appointed to the Institute's Scientific Advisory Committee. Another, Dr. Fares Chedid, senior consultant neonatologist, has joined the Institute's Research Advisory Committee. We also took a tour of the hospital, including the pediatric units. We've arrived, though two of our suitcases have not. People describe the Middle East as having "dry heat," but when we got here around 8:00 p.m., it was well over 90 degrees with 85 percent humidity. Even now, at about 4:00 a.m. local time, it's like a sauna outside. I've been working with Verizon to get my phone working, and now that it is, we're all set with technology. I now have access to phone, email, Facebook, Twitter, and our blogging tool. We've had much of our material translated to Arabic for this and future trips to this region. Here's Dr. Bear displaying my new business card in Arabic, and what "Sheikh Zayed Institute for Pediatric Surgical Innovation" looks like in Arabic. I'm sitting in Etihad Airways' lounge at JFK with Dr. Nabile Safdar, Dr. Raymond Sze, Dr. Julie Finkel, and Dr. Zena Quezado, awaiting our 13-hour flight to Abu Dhabi. When we arrive, it will be 8:00 pm Saturday (it's an eight-hour time difference). All of them are working furiously on their laptops -- they told me they're preparing for their meetings in Abu Dhabi, catching up on world news, and getting to emails and other tasks that are hard to do in the office. Sunday's schedule will have the doctors visiting Tawam Hospital and Sheikh Khalifa Medical City. Assuming technology cooperates, I'll post an update and photos from our first day there. Children's National Medical Center, in partnership with the George Washington University Medical Center, has received a prestigious Clinical and Translational Science Award (CTSA) from the National Center for Research Resources of the National Institutes of Health. This award, which totals $20 million over five years, is the first CTSA given directly to a children's hospital. Many other CTSA member institutions have research tracks that include pediatric research, but this collaboration will be the first ever to focus specifically on how scientific breakthroughs can be brought more quickly and efficiently to the care of young patients locally and around the world. In addition, the institution's close proximity to the nation's capital will bring basic science into community engagement research and health policy applications, making these discoveries accessible for those most in need. Diseases of adulthood that begin in childhood and are worsened or develop with age, such as hypertension, type 2 diabetes and obesity. The doctors and executives will be available for media interviews while they are in Abu Dhabi. 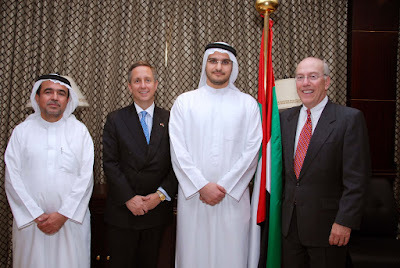 They can discuss the work of the Sheikh Zayed Institute and the historic partnership between the UAE and Children’s National Medical Center, the latest innovations in pediatric surgery, and other topics related to children’s health.